Let's get real for a minute – far too many women are scared to talk about money. Up until just recently, I was one of them. But after poring over invaluable sites like Daily Worth and LearnVest to educate myself on the tangled world of 401ks, IRAs and more, I realized that financial conversations have to take place in order for financial growth to happen. Whether it's speaking with your boss, your spouse or a financial advisor, we all need to take intentional steps away from feeling too timid to chat about our finances. There are even a few popular bloggers who post their monthly blog income reports for all of their readers to see – transparency is power! I switched jobs. When I moved to Colorado, it was inevitable that I was going to have to find a new job. I was fortunate in that I found my current role very quickly and that I didn't experience a financial lapse between jobs. However, I walked into my interview accepting the fact that I couldn't move forward with the job unless it paid more than my gig in Atlanta. Thankfully, it did! As I've grown in my role and have expanded my responsibilities, so has my salary. My advice: If you aren't happy in your current job, don't wait around - Millennials are moving around in jobs more than ever before, and we're savvy in that we're increasing our income with each job move! Go after positions that challenge you and give you a robust skill set. Strategic movement + quick growth = higher salary potential. I began freelancing. Over the last year I've used my free time very wisely, setting aside my afternoons after work to side hustle like no other. In the March of 2015 I took on a new copywriting client, and in July I began working with an international social media client to create content and drive engagement. The best part? By abiding by a weekly schedule, I still have a really fun life outside of my work! My advice: If you don't know where to start with freelance work, begin with a site like CloudPeeps that allows you to seek out clients that your skill set would suit best. I began taking my website seriously. That Working Girl is a huge part of my life, and something that I am so proud of. In growing the site, I've begun to offer a slew of creative career services, including resume design. Once I started focusing on promoting my services, the business came running! My advice: If you're blogging and want to take intentional steps toward monetizing your blog, take the necessary steps toward promoting yourself and your services. Offering free checklists or webinars is also a great way to stir up initial interest in your services. I don't act like I'm making my income. 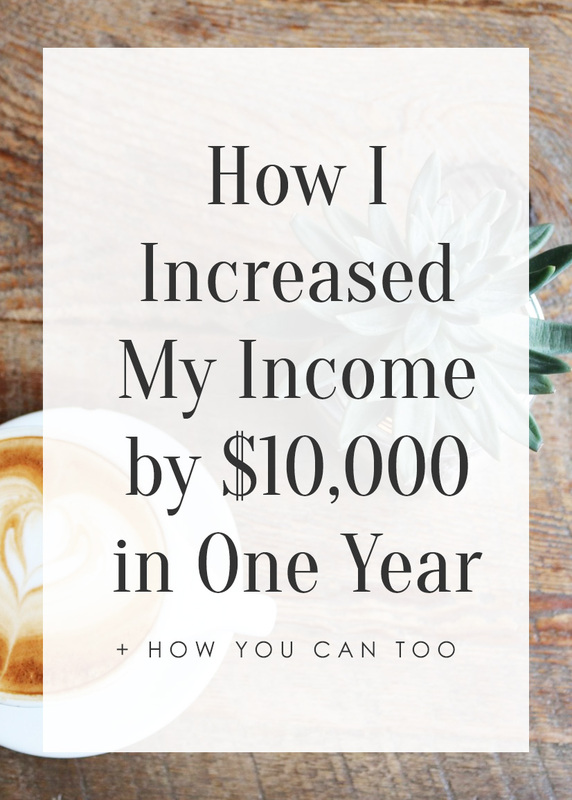 Here's the most important part of this post: although I've increased my income by $10,000 over the last year, I've tricked myself into thinking that I didn't. The freelance money and the income from my creative services? Nearly 100% of it is deposited into my savings immediately. My spending habits and budgets have remained the same. I'm not working harder and stepping up my freelance game to live a lavish life in my 20s – but to build the necessary foundation for a happy, debt-free future. How are you going to commit to boosting your income this year or in 2016? Leave your thoughts in the comments below or tweet us at @HeyWorkingGirl!